News that Hapag-Lloyd will move ahead with a merger with United Arab Shipping Co (UASC) has been greeted with approval by analysts and experts contacted by Splash. UASC announced yesterday that its six shareholding states has approved a merger deal with the German line at an extraordinary general meeting on Wednesday. The deal would see Hapag-Lloyd (which merged with CSAV 18 months ago) have a 72% holding of the new company with UASC holding the rest. Lars Jensen from SeaIntelligence Consulting noted how this latest merger served to heighten the stratification between large and small carriers amongst the global players. He also pointed out that all the changes in the industry mean we will look at carriers differently going forward, as the national connotations for the carriers will become blurred. 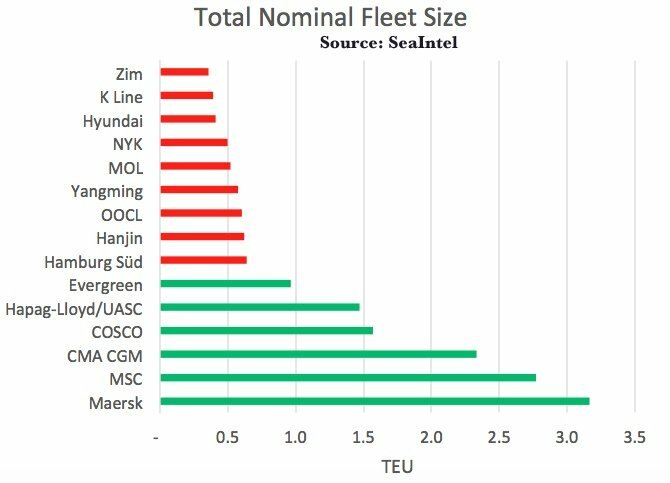 This is the same too for CMA CGM, which has just bought out Singapore’s flag carrier, Neptune Orient Lines (NOL). Even though Hapag Lloyd will remain headquartered in Hamburg, it will have a much more diversified background in its ownership base, with now both strong Chilean and Arab ownership stakes – a diversification which Jensen said can be a significant asset if harnessed correctly, but also a risk if there is not consensus amongst the owners with regards to the long-term strategy. UASC tying the knot with Hapag-Lloyd will likely mean UASC will be absorbed into the new container grouping, THE Alliance, which also features NYK, MOL, K Line, Hanjin and Yang Ming. Dagfinn Lunde from Dagmar Navigation told Splash the merger was “finally something sensible happening in the container industry”. He said it was a good follow-up to CMA CGM’s pursuit of NOL. “UASC and Hapag-Lloyd have nice complimentary strengths. I hope the cultures can work nicely together,” Lunde concluded.